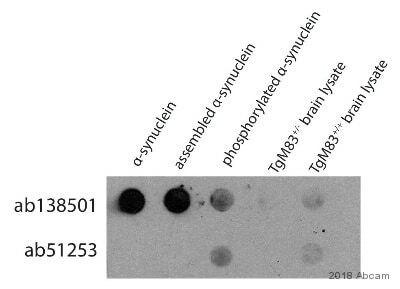 Is it possible to obtain the concentration of your anti-alpha-synuclein clone MJFR1 (ab138501)? ab138501 is an unpurified tissue culture supernatant product, so the concentration of the specific anti-alpha Synuclein antibody is not determined. However in general, for products of this type, the specific antibody concentration is about 0.05mg/ml. 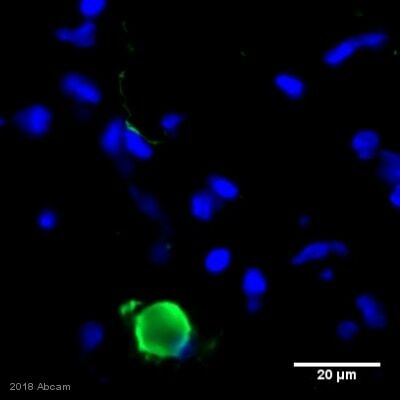 We would be interested in buying the Human Synuclein antibody [ab138501] in case it is guaranteed that the antibody recognises specifically human synuclein but not rat synuclein. I have conducted a sequence comparison between the human and rat alpha synuclein proteins and there is a very high sequence homology. Out of the 140 amino acids of this protein, 133 amino acids are shared between human and rat which suggests that it is unlikely that any antibody you will find to alpha-synuclein will definitely not cross-react with rat since there is no sequence within this protein that varies significantly between rat and human. ab138501 has been tested in mouse, rat and human and only showed positive results in mouse and human. This does not mean that it will not work in rat since with some optimisation, the rat protein could also be detected. However, since our datasheet specifically states that this antibody does not work in rat, we will honour our guarantee and if you buy and test this antibody in rat and find that it works, we will refund or replace the antibody.